The tone of the match itself was set in the very first minute when Wayne Rooney hit Claudio Bravo’s left hand post from 10 yards. A fortuitous rebound (from United’s perspective) hit Real Sociedad centre half Inigo Martinez on his right knee and bundled into Bravo’s bottom right hand corner. The goal was as comical as the last goal to go into that net, scored by Southampton’s Adam Lallana on Saturday just passed. It was just as well for United that Martinez graced us with his benevolence as judging by the performance of United’s forwards tonight, they’d struggle to finish their dinner never mind anything else. Chance after chance was spurned and wasted tonight. United were lucky that they played a team that had plenty of good players but didn’t play particularly well as a team itself. Any result other than a United win would have been a travesty yet if Sociedad had nicked a draw, United would have only had themselves to blame. It was good to see Shinji Kagawa back in the side, Ryan Giggs again defied father time and gravity with his performance and Rooney put in a controlled and determimed performance. 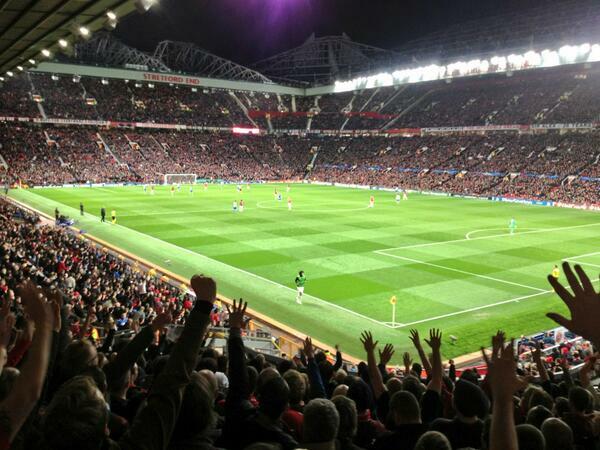 Having seen teams like Bayern Munich and Borrusia Dortmund recently, to my eyes, the harsh truth is United have not got a prayer of winning the European Cup this season, but performances like tonights give me heart that there will be some good european nights at Old Trafford over the next few months. It wasn’t perfect but it was easily United’s best showing since the shambles at the Commonwealth Stadium four and a half weeks ago. Hopefully United can now pick up some momentum from this game. After the allusion on Saturday to the Lord being unhappy over Southampton’s goal and the subsequent downpouring of rain, tonight four of his self appointed representatives appeared at the junction of Warwick Road and Chester Road after the match. They had come, armed with nothing more than a megaphone and The Truth (© Jimmy Swaggart). They had come to share the good news of repent and faith whilst advising all and sundry that none compliance would result in eternal damnation in the fires of hell. Nearby United fans, overjoyed with both tonight’s result and this sudden epiphany of eternal saviour (£5.99 per month plus VAT) went and joined the fab four evangelist’s and serenaded them with “What a friend we have in Jesus and his name is Cantona”. The preacher’s looked momentarily confused, if not downright terrified, but they eventually got the message. 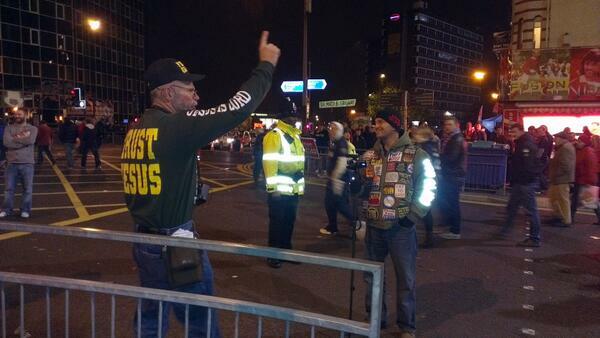 In 2010, Mancunian poet Mike Garry issued his celebrated poem, God Is A Manc, tonight we found out who his team was. We never doubted him. I am pleased to report I saw Murph flogging fanzines tonight, not from through his open car window after Saturday’s shameful driving antics, but stood on his own two feet in the night breeze. Fair play. Great summary of the match: no one’s got the foggiest how we’re gonna play every week, but it’s entertaining alright. What a friend we have in Jesus, and his name is Ralphie Milne!!!!!! 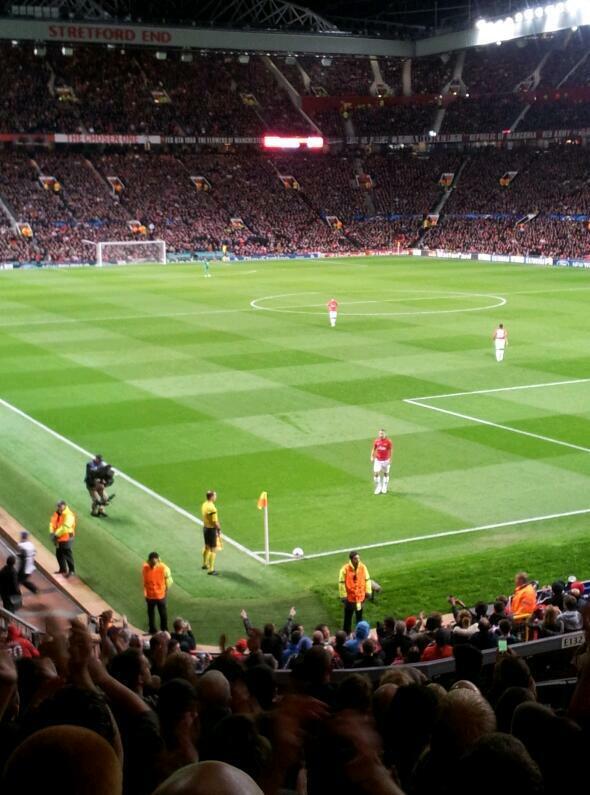 It was a relief to see Kagawa starting and then putting a better shift than he has ever done in this season. Watching on TV, I thought he was one of our better performers tonight. He first touches were subtle and deceptive and he made some excellent turns which left the defenders behind. Hopefully he can build on that. Overall a good team performance, but we all died a thousand deaths (courtesy: Roy Hodgson) whenever they crossed the halfway line in the last 10 minutes. From my temporary vantage point last night, I was in good spot to see the intricate play, between Kagawa and Rooney, which led to the goal. Moyes could do worse and ask me and anyone nearby, whether Shinner should start on Saturday. His quick feet and mind, have been sadly under used this term. Overall though, it was the defence that saw us thru’ last night. 100% effort was on show last night. Even Valencia was clocking the runner. The sing section was a clear success.But I believe it should be extended. To other parts of the ground. It could create in ground rivalry of yesteryear. Free seating, so you can stand near your mates, would I believe grow from that kernel of a noise.